This video shows the construction practices using REBs. The video was shoot during the mason’s training program focussing on workmanship using REBs for building construction like on-site cutting of blocks, plastering, mortar application, fixing of doors and windows, chasing, allowance for conduits for different service and load fixation like mirrors, TV, Geysers, water closet etc. 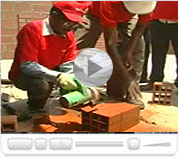 The video shows semi-automatic brick production. While extrusion process is done in machine, the upstream and downstream processes have human interface for handling of bricks in different stages of production. The cost of semi-mechanization units are lower compared to semi-mechanization plants. 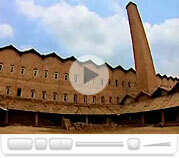 The video shows construction practices with resource efficient bricks (REBs) in India. Use of REBs in construction help in reducing the masonry costs and the plaster requirements.